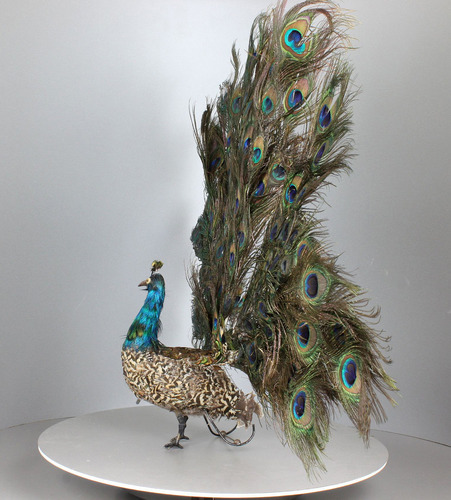 The proud and life-like Indian Pavo Cristatus comes to life the moment the start/stop lever to lower back is actuated after winding with its key. 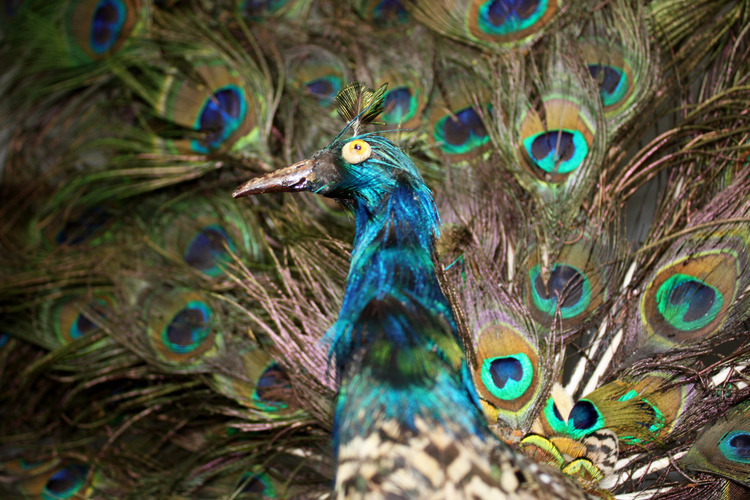 He turns his head to the right and as the head returns to the left he begins to walk forward, completely composed and balanced, his head turning all the way across to the left and then straight ahead before suddenly stopping in his tracks and lifting his tailfeathers upright and forming the astonishing feathered display. He holds this stance for a few seconds before the fantail gently lays down to form the tailfeather once more and he walks off turning his head to begin the whole performance in its entirety again and again. 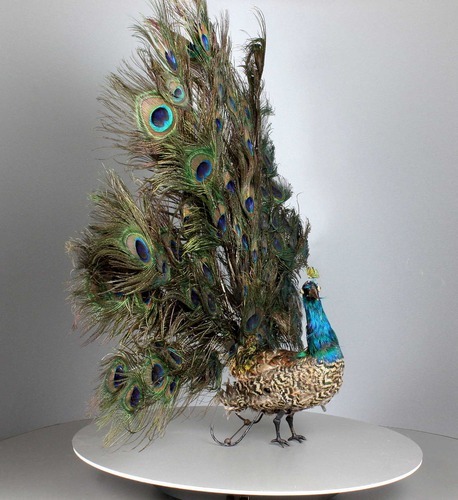 The bird fully feathered with complete peacock feathers, from the full-height fantail strands to the tiny bob to top of head, detailed cast metal feet with delicate gilt tone, back bracket for stability with twin rollerballs, the movement is contained within the void of the body of two papier-mâché halves, with open spring-work, spindle hole for key-winding access to side, start/stop lever to the R&D design to lower back, beautiful naturalistic eyes. 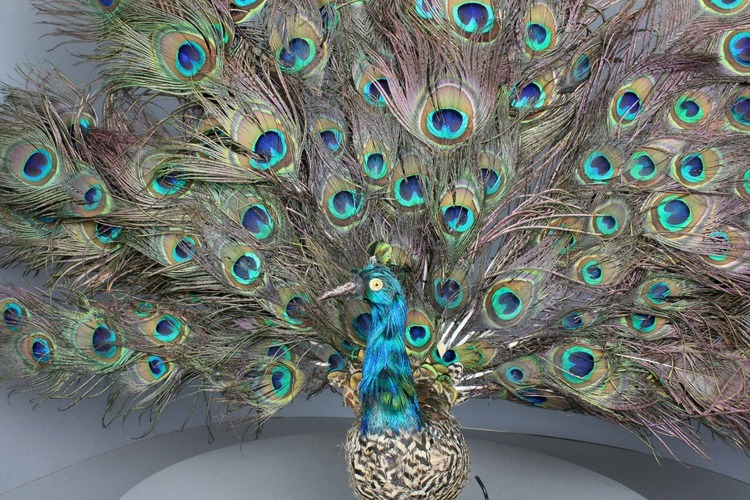 Another chance to capture a rare glimpse of one of the most sought-after automatons in the world. 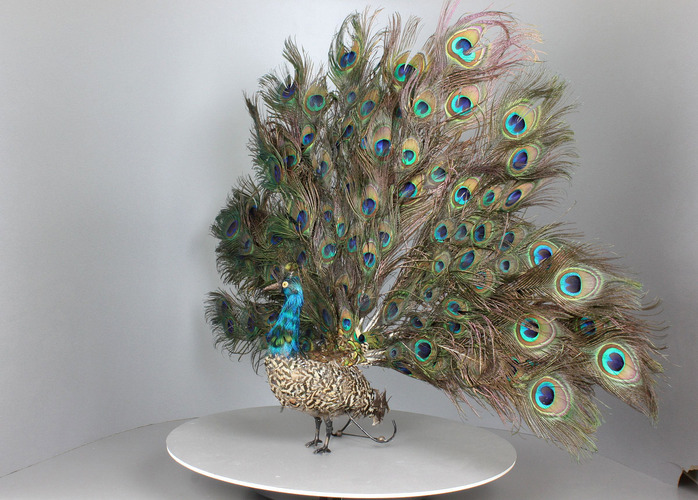 We proudly present this amazing peacock whose creation is more android than automaton. 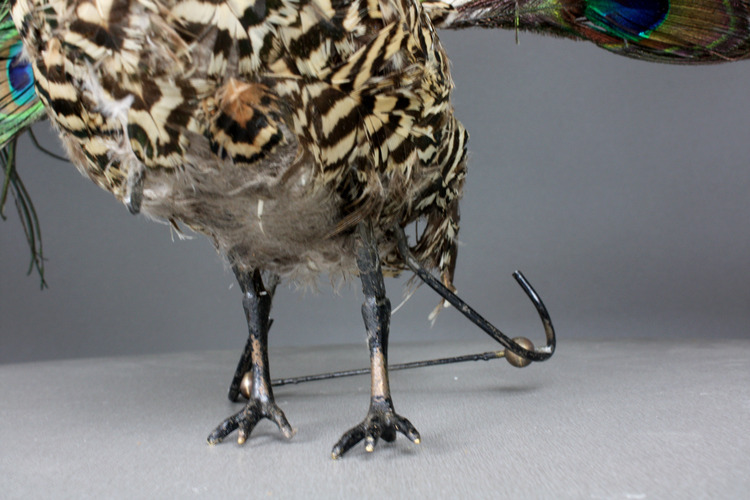 Life is the size, lifelike is the movement, the walking and above all, lifelike is the display of tailfeathers - a true and sensible copy of life, from life. 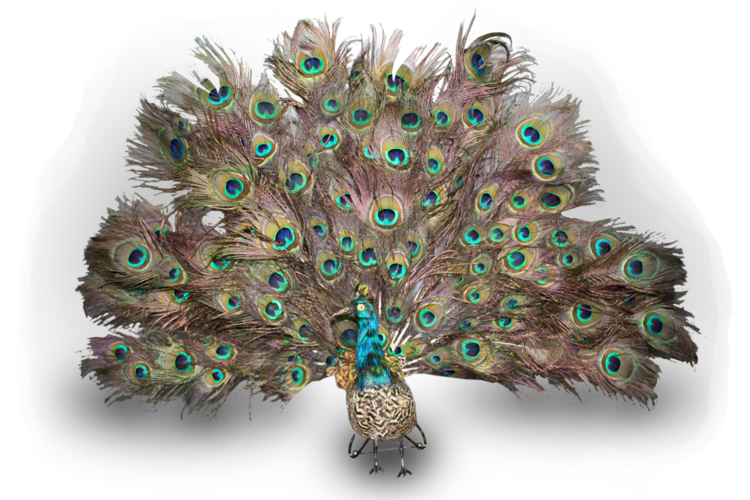 The feathers are all real peacock, down to the tailfeather spines which structurely, just as with the beautiful living creature, hold it all together to pull off the performance. 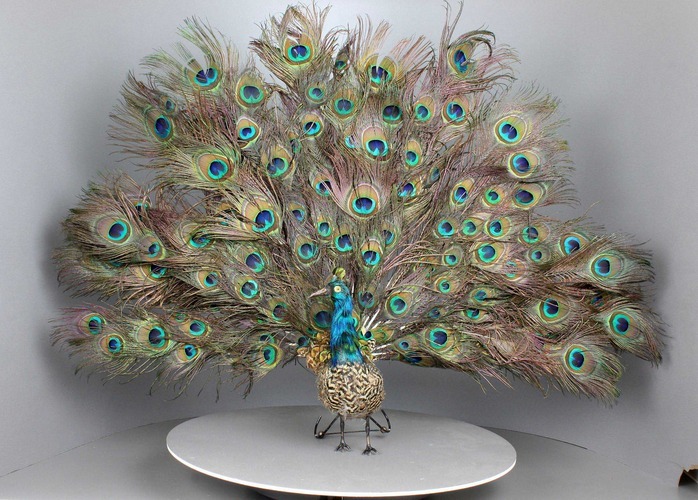 The largest of the three R&D made from around 1893, this grande modelle spectacular is not only a must see for the automaton follower, but a must have for the automaton connoisseur. You have been warned - he is more real in person and will strike both wonder and shock when he springs to life with the touch of a lever. See 'Automata - The Golden Age', C. Bailly, (pp.285-6).